Special pujas are performed for Lord Veerabadra on Panguni Rohini Star day in March-April. The other festival is Maha Shivrathri in February-March. The temple is facing west. 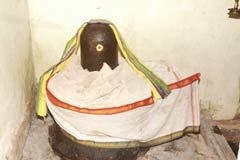 Lord Shiva who graced the Nava Kannikas (nine virgins) blesses the devotees as Lord Kasi Viswanatha in this temple. This is also the place where the great Tamil literary work Thakka Yaga Barani authored by Poet Ottakuthar was staged. The temple is open from 6.30 a.m. to 12.00 a.m. and from 4.00 p.m. to 9.00 p.m. The Administrator, Veera Saiva Mutt, Sri Agora Veerabadra Temple, North Bank of Maha Magam Tank, Kumbakonam-612 001, Thanjavur district. +91- 435- 242 3643, 99440 56002. Lord Dakshinamurthy in the Goshta wall and Mother Rajarajeswari in the prakara grace the devotees. A five time puja is performed on Shivrathri day. Women pray for protection and child boon. They light lamps made of rice flour mixed in ghee, known as Maa Vilakku in Tamil. Realizing their wishes, devotees perform special abishek to Lord Veerabadra and offer vastras and garlands of betel leaves. 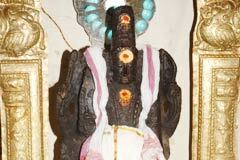 The temple has a Rajagopuram. Lord Veerabadra has two sharp teeth. He is holding bow, arrow, sword and danda. 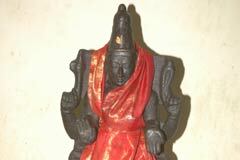 Daksha is nearby in a bowing posture. There is a water bowl (Jaladara) above His head. Mother Badrakali graces from a separate shrine. 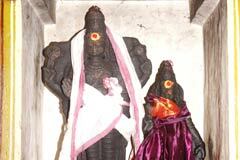 Lord Veerabadra is also praised as Gangai Veeran and Gangai Veereswarar. Holy Ganga is one of the nine sacred rivers of India. He was the protector of the river deities that came here led by Holy Ganga, hence these praiseworthy names to Him. Pradosha puja is piously offered to Nandhi opposite the Swami shrine. Ottakuthar was the poet laureate in the court of Chola king and was a staunch devotee of Lord Veerabadra. He was staying in the Kumbakonam mutt for sometime. He authored an epic titled Thakka Yaga Parani and placed it for the approval of Lord. Parani is a literary form celebrating the victory of the hero. As Lord Veerabadra destroyed Daksha’s yagna, it is titled Thakka Yaga Parani. The poet appears in a worshipping posture near Swami shrine. Guru Puja is celebrated to the poet on the Aavani Uthiradam star day in August-September. 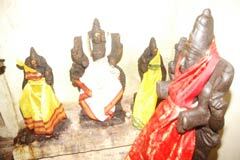 Nava Kannikas are in idol form in the temple. 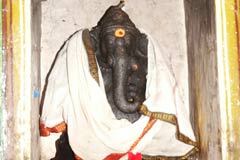 While Lord Kumbeswara visits Maha Maga tank on Masi Magam day in February-March, He also visits Veerabadra shrine. 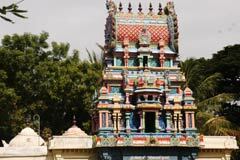 The priest of Veerabadra temple will offer pujas to Lord Kumbeswarar. 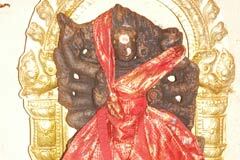 It is considered that Lord Veerabadra Himself does this puja. Moorka Nayanar among the 63 Nayanars also served the Lord during his stay in a mutt here. There is a shrine for Nayanar. Guru Puja is performed to Nayanar on Karthikai Moola Star day in November-December. Holy Rivers – Ganga, Yamuna, Narmada, Saraswathi, Cauvery, Godavari, Tungabadra, Krishna and Sarayu were sad that they had to bear the sins left by the devotees by bathing in them. They went to Kailash and submitted to Lord Shiva to relieve them of the burden of sins endured by them. Lord Shiva advised the river deities to bathe in the Maha Magam tank on the Maha Magam day and cleanse themselves. Lord also deputed Veerabadra to help them. The rivers came to this place and had their wish fulfilled. As their guardian, Lord Veerabadra has his temple on the banks of this tank. Miracle Based: The temple is facing west. 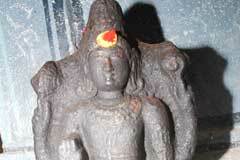 Lord Shiva who graced the Nava Kannikas also graces here as Lord Kasi Viswanatha. 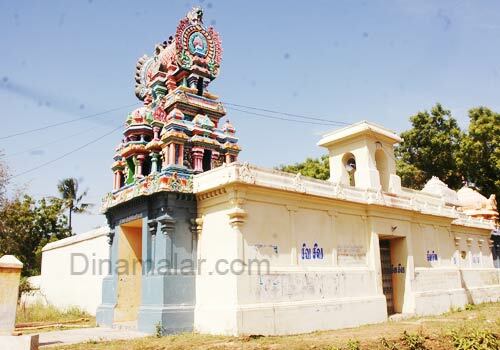 Great Tamil epic Thakka Yaga Parani was staged in this temple. The temple is on the banks of Maha Magam tank. All buses from Kumbakonam bus stand pass through the temple.